Going to Ile de Ré in France is like going back to nature in many respects. A 30 km long island, with a scarcity of cars, means it is a safe place for families to holiday, especially those who appreciate nature, outdoor living and like to travel without a car from time-to-time. This is a little corner of paradise for those in-the-know, who return year after year, given its unique set-up. These apartments are selling really quickly for precisely these reasons. Low density build, low rise, character architecture, surrounded by beaches and sea, with some of the most picturesque harbours to rival St Tropez's. This is an unrivalled opportunity to buy new-build on the island. Regular visitors will know this is pretty unheard of on this island. 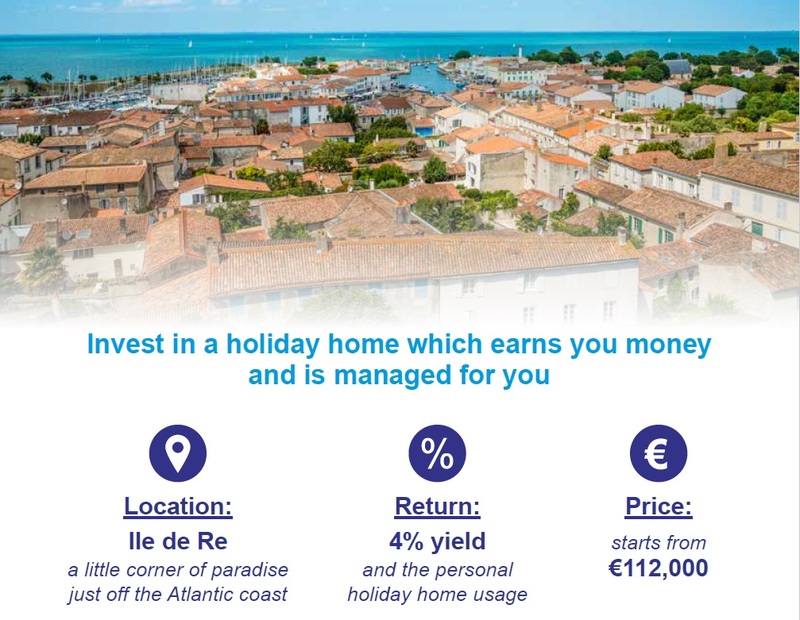 Grab your chance to own a holiday home which can earn you money. Download the brochure now, while there are still some units remaining. Market: 30km long upmarket island with an established residential and tourist market. Character, coastal properties and an absence of new build, mean these apartments have a rarity value. You will receive a registration e-mail. You just need to click on the link in the e-mail to get immediate access to the Information Pack and to confirm you registered. It should only take a matter of minutes, but please do check your junk or spam e-mail in case it gets caught up. Please add property-venture.com to your trusted or safe-sender e-mail domain list. We do not spam or share your telephone number or contact details with third parties, other than in relation to this enquiry, or purchase and for the day-to-day conduct of our business. On the Advisory Board of the Association of Property Professionals (AIPP), this means Property Venture® has been vetted, approved, and voluntarily commits to Industry Regulation and the Professional Code of Conduct established to help potential buyers or investors, buy overseas property with confidence.